I am so glad it is Friday. Having time off in the middle of the week was awesome, but it completely threw my week off. I thought yesterday was Monday, but it was really Thursday. Sadly, I have to work all day today since it is a holiday week, but at least everyone else at my work does too. ONE. We had the best 4th of July. We got up, gave the girls baths and got them in their new festive gear. Then before we headed out to breakfast, I made everyone stop and take photos. The girls were so thrilled (not). We had to drive around a bit to find a restaurant that was open on the 4th. After breakfast, we headed to Petco to get Walter more food (a bigger bag of the new one we got him) and then down to the mall to pick up a hanger for our coffee bag piece we got in Hawaii almost 4 years ago. The hanger didn't fit, so now I am on the hunt for another one. We tried to stop in Lululemon, but they were not open yet. So we decided to head to a nearby park. We got to this park everyone talks about and they were setting up for a 4th of July event, so we had to park around the corner and it was pretty busy there. This park was amazing. They had swings, some kind of teeter totter and two huge play structures. The one in the picture above was three stories high. After the park, we headed home for lunch and naps. The girls didn't nap very well. Well Sutton didn't. She ended up watching The Secret Life of the Pets with me while her sister slept. Once Avery woke, we got everything packed for their sleepover at their grandparents house. Around 3 pm, Rory headed to his parents house to drop off the girls and Walter (so he wouldn't be near the fireworks). I freshened up and waited for Rory's friends to arrive. His best man from our wedding was coming up from California with his girlfriend. Once they got there, we said our hellos, gave them a tour of the house (updated kitchen) and got to catching up. We took an Uber downtown and had appetizers and drinks on the river. It was so beautiful outside and the weather was amazing. After drinks, we walked over to the Basement to show them the beautiful building, but they were already closed. So we walked over by the ballpark for dinner and drinks. We did lots of people watching and enjoyed the slight breeze going on. We wanted to show them the ballpark, so we walked over to the second story bar and were able to go up. I am not sure if it was because the game was close to being over or they just didn't care, but we went in for free. We grabbed another drink and watched the rest of the game (2 innings). Once the game was over, they set off fireworks. After the game was over we headed back down by the river to a bar and did more people watching. Around midnight we decided to walk home since it was just over a mile away. And that walk was so beautiful at night. So much fun. TWO. Remember how I bought three dresses for the wedding I am going to next month? Yes, the one I have mentioned a million times. Well I finally took some photos Wednesday of me in the dresses. Well two of them. The third should be here any day now. So what do you think? I love the color of this dress, the lace and the feel of the dress, but I am unsure on the length of the dress. The photo on the right where my arms are down isn't that flattering, so I am not sure about it. I love the length of this dress, the fabric, but it is slightly big on me. It doesn't show that it is bigger in the photos, but the chest is a bit big, but nothing a strapless bra can't fix. And the last one is the beige maxi dress I posted last week. That should arrive any day now. THREE. When we had our friends over on the 4th, we showed them our backyard and all the work we put into it with the DG. They suggested we get some sort of corn hole game and we could teach the girls to throw the beanbags for hand eye coordination. Plus it would be fun for summer evenings. So we are either thinking of getting one made or finding one we really like. But while searching for a corn hole game, we found this Chippo game which would be so much fun. Plus I definitely could use some chipping work. FOUR. Remember the cute Allbirds shoes I talked about here? Well I got them this week and put them on and complete comfort, BUT my toes went to the end of the shoes. I bought a size 8 and I am always a size 8, but I am afraid they are too small. So I am sending them back (free) and hope to get the next size up. But when I did try them on they felt soooo amazing and comfy. Like walking on pillows. I will update you when I get my exchanged pair. I hope you all have a good weekend! you and the girls look darling in your festive fourh of july wear! I love both the dresses but the lace one is my favorite, the color is perfect and you look great in it! I hope ya'll have the best weekend! 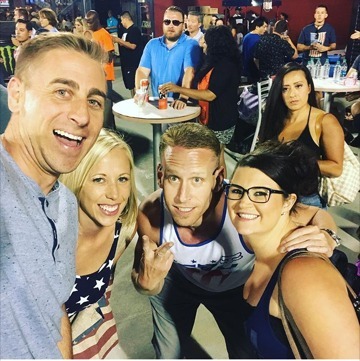 An adult night out on the 4th? How fun!! I love both dresses but I think I like the 2nd better. Chippo sounds so fun, need to show that to the hubby! My vote is for the purple dress! It looks so pretty and like it would be more comfortable. Glad you had such a great 4th-those holiday weekends are the best! Love those dresses. I dont think you can find anything that doesnt look good on you. you & your girls in your 4th garb looks ADORABLE!!! Y'all look so cute in your 4th of July outfits!! I love both dresses but the second one is my favorite. You know I'm completely obsessed with off the shoulder and one shoulder looks right now, though, so that's probably why! Plus, that ruffle is so beautiful. Okay, borne dresses look awesome but my favorite is the first one. I love the color and the lace. As for length, you can totally pull it off! I love the one shoulder dress on you! I love your festive gear! Sounds like a fun night with the best man and his lady! Is that the guy you were telling me went to LSU? Have a fabulous weekend! Okay, the three of you in your matching gear is just too cute for words. I also love how the girls look matching, but still different. So cute! And, ugh, how to choose between the dress?!?! You look great in both hun. I love lace, but I love that ruffle too. Ha, I'm no help! You all look so adorable in your festive wear, and I love your shoes. What a fun 4th. 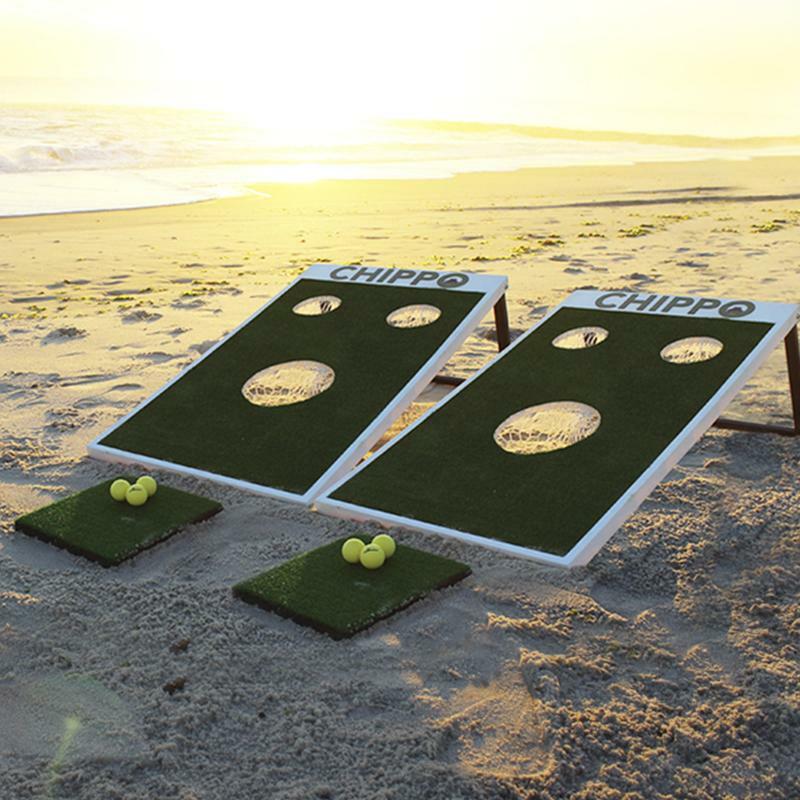 I love corn hole, but I have never head of Chippo, it looks like a lot of fun! Have a great weekend! Love all of the photos from the 4th!! So fun!! Those dresses are great!!! Bummer on the shoes but a bigger size will hopefully be perfect. I love both dresses but I think the second is my favorite! Glad you had a fun 4th! Your tank top is so cute! 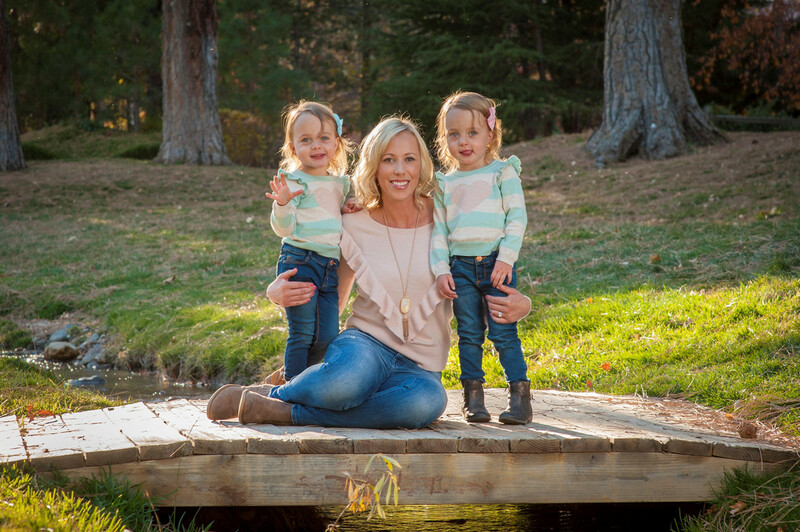 Your coordinated red, white and blue outfits with your daughters are too cute! I'm loving everyone's mom and daughter outfits from the 4th! I really love dress #2 on you! I can't even tell it's too big. Can't wait to see the other one when it arrives! Ohh your 4th of July wear is darling, so coordinated!!! & Both of those dresses are great!! I love the lace one :) Hope you had a great weekend! Oh my heavens those matching outfits!!!! !